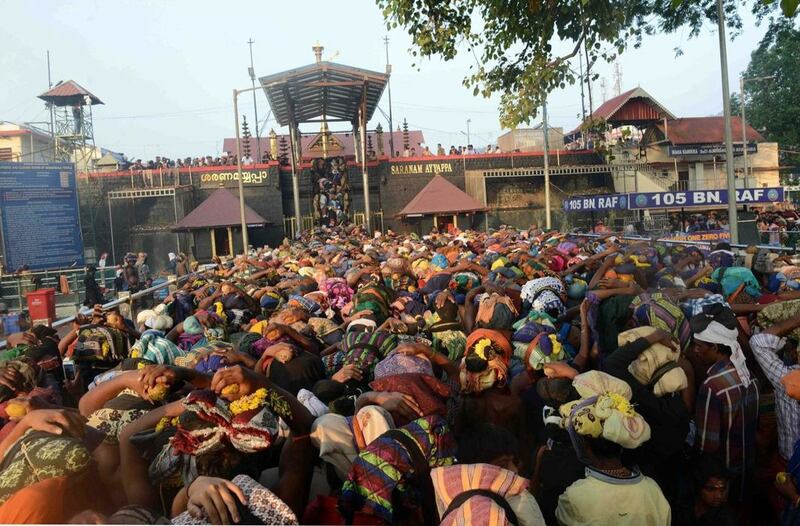 With only two days left for the Sabarimala temple to reopen for a two month long season, there is a palpable tension in the air as both pro and anti women’s entry groups once again ready to ensure that their writs respective writs run. Both sides feel emboldened by the Supreme Court decision yesterday to agree to hear the review petitions on January 22. Ayyappa devotees are now hopeful of the original decision being turned down, while the pro entry groups also are optimistic because the SC has not allowed any stay on its September 28 decision to allow women of all ages to enter the temple. The government is responsible for ensuring protection for women who reach Sabarimala since the Supreme Court has clarified that the earlier verdict allowing women of all ages has not been stayed. The temple will get opened on November 16 and it will get closed on December 27 for the Mandala Pooja. It will again be opened on December 30 and will close on January 20. The SC will consider the review pleas on January 22. While it is for the police to ensure security during the whole pilgrimage season, it is no easy task since the anti womens entry groups have vowed not to allow them. .. More than ten thousand policemen will be deployed at Sabarimala. They will be deployed as five stages. The Devaswom board that runs the temple has decided to place CCTV cameras along all entry routes and watch towers are also being constructed as observation decks.